Being long interested in HTML5 (and all that other stuff) I sometimes think about it's future, especially regarding it's commercial use. Once, I've got a particular evil vision about possible (video) DRM implementation using HTML5 goodness. We can argue whether the whole DRM concept is a good or a bad thing. It is though inevitable for commercial content to come to the HTML5 world. Here, probably, should I rant about music/movies industry being stagnant, old-fashioned and closed-minded. I won't, there's plenty of examples in the aforementioned Wikipedia article. Folks are really vocal. In this (and probably one future) post I'm going to loudly think about the technical side of this problem. once you have a video in your cache you can practically watch it any way you like, yay! user is free to download video/audio data for further playing, editing, etc. These just make some content-clingy people sad and angry. There's no easy way to specify how and when you can play a particular video. Also, our Flash and Silverlight friends seem to have it all figured out. 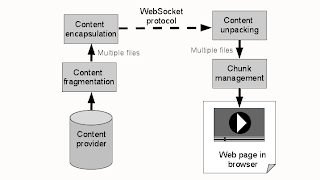 Using a WebSocket to transport video data to the client may present a few advantages. One can build a dedicated header-light video serving architecture. You can stream chunks to the browser in any fashion you like. You get all sorts of real-time feedback since the protocol is full-duplex. We can cautiously claim the third issue is taken care of. But boy, is it slow -- base-64 encoding adds up to 30%-40% overhead. You eat up more resources and waste a lot of bandwidth. 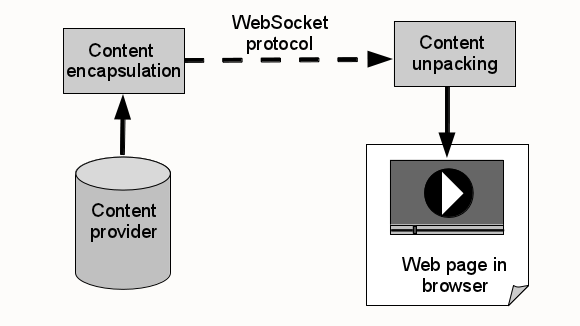 Thankfully, HTML5 people are working hard to provide binary frame support for WebSockets. Meanwhile, one can say we eliminated the last problem as it's difficult (if not impossible) to differentiate between main (expected) content and advertising. Our workflow provides us with another layer of opacity. That's neat but there's another issue. It is not possible to just inject intermediate video data into your HTML5 video player. You have to provide a complete video file, headers included. Otherwise the browser will just ignore you, at best. Some work is being done at Mozilla to provide low level access to audio data. There's no such thing for video content, shoot. I guess that means the first problem is also solved. You can now use many signals (headers, cookies data, browser info, you name it) and make fine-grained decisions about the content that's being played. You react to the changes on a (small) chunk level. After implementing your own player controls (those provided by the browser are now useless) you decide which piece of content is viewed by whom. After all you can simply cut the cord by closing the WebSocket. Enough for this post. Still it's not the end of the journey. 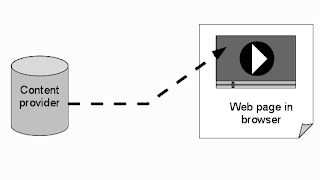 Your chunks approach is already done, as "http adaptive streaming" - see Adobe HDS, Apple HLS, MS Smooth Streaming. The simplest IMO is Apple HLS. Its index of chunks is simply a .m3u8 file, plaintext extension of mp3 playlist. On Apple devices (including computers), their browser can use a .m3u8 as src of a video tag and play this natively - quite nice. It even has provision for encryption (128 bit AES), but the problem is protecting the key - not during transport - that is done with SSL easily-enough, but once it's on the client; Problem with non-compiled approach is easier to reverse engineer and extract decryption key; why Silverlight and Flash are still attractive in this case, even if WebSockets did binary efficiently. Hey Nick, thanks for the info about adaptive streaming. I'm aware of the security implications of storing/handling a crypto key in the JS layer. Still I don't think it'd particularly hard for a determined hacker to extract such key from Silverlight/Flash environment. As we all well know one leak is usually enough to lose a hold of loads of content. On the other hand I have to agree, there is not much to do (for now?) without a browser plugin.